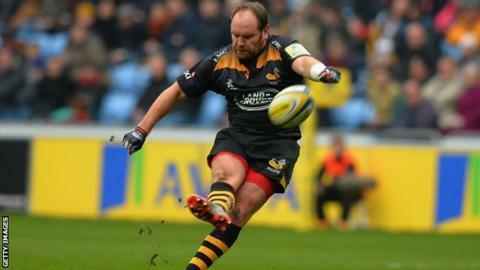 Wasps will be able to cope without prolific fly-half Andy Goode for the forthcoming Premiership season, says back rower Guy Thompson. Former England international Goode, 35, left after two seasons to join London Irish, with Jimmy Gopperth arriving from Leinster to help fill the gap. "Players move on - Andy had great Premiership experience," Thompson, 28, told BBC Coventry and Warwickshire. Those awards - for the top scorer in the Premiership - were won by New-Zealand born Gopperth, 32, during his time with Newcastle in 2010 and 2011. And although he has big boots to fill, with Goode second on the all-time list of leading points scorers in Premiership history, Thompson thinks Gopperth can do an excellent job. "On top of his Newcastle career, he's got great experience with Leinster in the Heineken Cup," Thompson added, "I think it's a fantastic signing." Thompson also praised the impact made so far on the Coventry-based club by another of their nine new signings - Australia flanker George Smith. The 35-year-old has won 111 caps for the Wallabies and Thompson says having him around has already made a difference. "George joined us about three weeks ago and he's made a great impact on the field with the boys," he said. "He's the ultimate professional and, on a personal level, you'd be silly to waste the chance to learn off someone like George - one of the greats of the game." Wasps, who finished sixth in the Premiership last season, start their 2015-15 campaign at Harlequins on Friday, 16 October.